Search pool homes for sale in Jacksonville area including homes with pools in Ponte Vedra and pool homes for sale in St Johns County. Honestly, what could be better than that tropical oasis in your back yard here in North Florida? This is one of our most requested features from home shoppers, so if you've landed on the search for Pool Homes in Jacksonville, you aren't alone! The beauty of buying a home with a pool is that someone else has already paid for the major expense of getting the pool in place to begin with. When shopping for a home with a pool in Jacksonville, make sure to budget for some repairs and updates. We don't see many home inspections on houses with pools that are free of repair items and that's fairly normal. You'll also want to update your pool with maybe new pavers, additional water features, lush landscaping, etc. All will be great resale in the future! See all homes with pools for sale below. Should I get a Pool Inspection When Buying a Home with a Pool? Oh yea you should! The cost for repairs on a deferred maintenance pool will be into the $thousands. Many times home owners never know they have maintenance issues with their pool as they slowly decay over time and are less obvious. A qualified pool contractor / inspector can spend an hour and give you a full assessment of the pool you are buying, how to care for it, and budget items to plan for. We have a list of qualified pool inspectors when the time comes and all our customers have access to our preferred inspectors. If you are considering buying a home with a pool, get a pool inspection! Will a pool raise the value of my home? Yes. 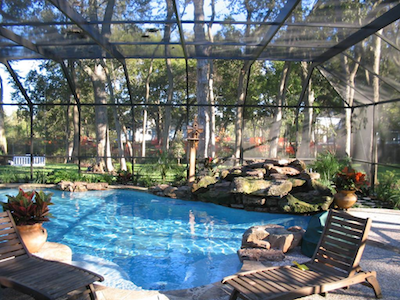 In Florida, a pool is a desirable feature that many are shopping for. We have an endless supply of home buyers that are shopping for a home with a pool. Often times, the pool is a deciding factor on buying or passing for another home that has a pool. That being said, don't expect a dollar for dollar payback. Like all upgrades and renovations to a home, there is almost never a 100% payback of the dollars paid to install and operate a pool. Will your home sell faster with a pool? Probably. Will your home sell for more than your neighbors when you have a pool and he doesn't? Most likely. Above all else: A pool is a lifestyle choice, so enjoy it!